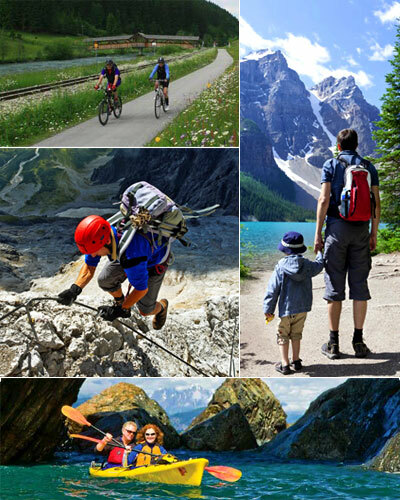 Active Holidays are one of the most popular and fastest growing travel styles worldwide. Active holidays are often confused as adventure getaways and though an active holiday can at times be action packed, the fact is that the range of activities is so vast that not all active holidays end up in an adrenalin rush you may associate with bungee jumping. Quite simply, an active holiday allows you to experience a destination or region in a way that allows you to combine your love for travelling with that of an activity. From completely relaxed ones - like walking, to totally action packed ones like mountaineering and even moderate activities like cycling – there are many choices for you to combine your vacation with. If there is any activity that interests you is not featured on our site, feel free to get in touch with us. Truth be told, an active holiday is truly a wonderful way to bond with your family. Not only is the pace of many of our vacations appropriate for families with children, getting them out there allows them to view and appreciate the world (and you) in a different way. And you to spend quality time with them. Some activities may require children to be of minimum age or may not allow children, keeping in mind their safety and ability. As our vacation options include self-guided and guided tours, we recommend that you choose them carefully when you are travelling with your family. Active holidays are appropriate for people of all ages but if you need more inspiration, let us share that the oldest woman to have submitted Mt. Everest was 73 years young at the time that she accomplished that feat. And Fauja Singh is still running full marathons at 100+! We recommend that you consider your ability and fitness level for the activity that you are choosing rather than focus on your age. There are several young folks who cannot cope with regular day–to–day physical activities. Plus, the choice of activity also has a lot to do with how much or how little you need to exert. Our vacations come with an activity meter and you can choose vacations based on these, considering what you think you will be most comfortable doing. Food is a central activity of mankind and one of the single most significant trademarks of a culture’ said Mark Kurlansky. We don’t just agree, we truly believe that the best way to experience a destination is by going as local as you can – especially when it comes to food. So whether it that bistro or pizzeria at the corner of that street or the tea-houses run and frequented by the locals, we encourage you to eat local. Vegetarianism having become popular worldwide, we don’t expect our vegetarian guests to go hungry but we do appreciate your understanding that at times, your choices could be limited or somewhat repetitive. Oh, and remember not all our vacations include all meals – you will often be vacationing at your own pace, stopping where you like and eating what you want though depending on what vacation you have signed up for, at times you may need to stick to the plan and eat at places where the group stops. They both have their advantages. You will have the opportunity to set your own pace when you decide to do it all by yourself – start when you want and stop when you like. However, depending on your activity choice - you may also need to keep in check your level of expertise. For example, if you are planning on a cycling trip, going with a group will give you access to assistance with repairs etc. , if the situation arises. Similarly when taking a trek that includes climbing high altitudes, being with a group is an assurance of help being at hand, if you get hit by altitude sickness. Having a guide also helps you to unravel the stories behind places you are passing through and enjoy the destination with secret insights that only experts on the region can offer. On the flip side, you have to stick to some schedule and the price is a factor too. Sometimes, travelling on your own is cheaper and at other times, it can be the opposite. If you are unsure, our team can help you to make the right choice. The probability of getting an injury on an active holiday is the same as getting injury playing cricket or basket-ball at school and that is certainly higher than the probability of an injury staying home and indoors! So, the risk of injuries in living actively exists. And this is why we have taken pains to find reliable, experienced partners on ground, whose safety standards as well as their ability to support our travellers in case of emergency is of paramount importance to us. They are not always the cheapest, we know, but we are sure of their support and reliability. Our trips, vacations and activities are based on strict safety guidelines. Children have to be under parent supervision at all times. All our trips offer you access to a helpline or an emergency contact, even if you are on a self-guided trip. On some trips, you may have the option of skipping excursions and activities helping you recuperate. Help will always be close by. However, you must realise that there is often no option to change the itinerary, especially if you are in a group. If you have to cut short your vacation or change or alter the itinerary, cancellations are due to suppliers and you are unlikely to receive a refund. For this reason, we recommend you choose your trip carefully evaluating your own physical ability and buy an appropriate insurance to help you cut your losses, if the situation arises. Many of our trips are designed from the vacation perspective so you can enjoy the destination and they are very comfortable for people of all fitness levels. Yet, we have an occasional trip that you can choose to break your personal records. We have tried to grade our trips on a scale of 1 to 5 to help you choose a trip appropriate with your ability. Having said that please note that this is an extremely over-simplified guideline of our trip scale as it is impossible to give a uniform standard to compare trips based on different activities, terrains, countries, weather conditions, duration and challenges. You may refer to individual FAQs to understand the specific ratings as well as contact us if you are unsure. Grade 1- Very easy, good for people of all abilities including first timers. Grade 3 – Requires good fitness. Some rough days may be interspersed with light ones. Grade 4 – Challenging. May warrant prior training and very good fitness levels. No, our trips are not standardised and to be honest, we try not to standardise anything. In fact we are trying very hard to ensure that we don’t fit anything ‘in the box’. We want you to discover the destination and enjoy it for what it is. And that can mean that you simply go with the flow and at times take the differences in your stride not judging – for example the standard in Asia is very different from what it is in Africa and Europe and even in Europe the standards of Northern and Southern Europe are not comparable. Even if you are going solo, you can benefit from our services as we handle all the logistics of your trip. Though you may take the single supplement and stay in your own room, at times, a trip with us can mean savings for single travellers. To save on a single supplement – check with us if there is a single traveller for your trip who is also looking to share a room. On some trips single rooms may be difficult due to the limited supply of rooms. We will let you know before you book, when this situation is likely. Unlike big tour operators, we do not hold any inventory at accommodations unless it is a guided trip and even then we have to check if we have the space to accommodate your booking. For all independent trips all overnight accommodations have to be contacted individually to get your tour confirmed. If any accommodation option in unavailable we will discuss options with you – including refunding your deposit if our options don’t work for you, however, no booking request will be processed unless we have received your deposit. Please do not make any other travel arrangements unless you have received our confirmation as we are not liable for airline tickets and visa costs if these are done prior to your trip being confirmed. Just like our vacation choices, often our hotels are diverse too. But as a company that strives to deliver the real destination experiences through activities that allow you to come face to face with the cultures of the destinations you are visiting, we try as far as possible to include hotels that are run by locals. Often these can be family run Inns, at times they may be fabulous villas and at other times, such as when you are trekking up the Himalayas – they can be so basic that even an attached bathroom is considered a luxury. Having said that, taking an active holiday doesn’t mean that you have to settle for less than luxurious. Some vacation options may give you the opportunity to upgrade and if you are inclined to something fancier on your vacation, just mail us and we will be happy to get it over to you. Yes, that is one of those things that is not in our control but are you seriously considering an outdoor adventure and thinking about this? Remember, uncertainty and having to rough it out is part of the adventure. Though, we recommend that you be prepared for cooler temperatures, sunny days and the rain. Usually, you are allowed 20 kilos, however, on some of the other trips – particularly when on an ‘On your feet’ trip, your baggage allowance may be restricted to as little as 15 or even 10 kilos. Your luggage should be appropriate for the type of vacation you are choosing. Bags with wheels and hard suitcases are a bad idea on treks though they may be what you need on certain other trips. Though it is safe, please note that we take no responsibility for the contents of your luggage and damage to it. We strongly recommend that you carry along a small back-pack for day. There are luggage restrictions on several trips. You may also need special equipment for certain trips and this may or may not be included in your trip price. Sometimes equipment can be hired locally at a reasonable cost. On the other hand some trips may need you to arrive with special type of clothing / footwear etc. We will be able to give you details at the time of booking and give you a comprehensive packing list before departure. The Active Holiday Company offers a large range of trip options in varied styles and as such we are inundated with requests for trip quotes that need focussed time and effort resulting in actual expenses. To meet these costs, we offer custom quotes against a non-refundable fee of INR2000 or US$30 per booking (comprising any number of travellers). This fee entitles you to a maximum of 3 iterations of your customised itinerary and costing. If you confirm a booking based on any of these iterations, the non-refundable fee of Rs 2000 / USD 30 is adjusted towards the final cost of your trip. So, if you do take a trip with The Active Holiday Company, consider this your initial investment instead of a ‘charge’.